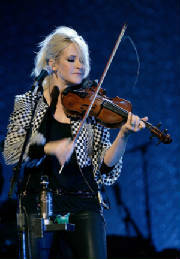 Two of music’s most successful bands, the Eagles and Dixie Chicks, headlined the first concerts at NOKIA Theatre L.A. LIVE, downtown Los Angeles’ new 7,100-seat state-of-the-art theatre. Some members of the Accidents & Accusations touring band returned to play with the Chicks. David Grissom (lead guitar), Keith Sewell (guitar) and Larry Knechtel (keyboards) teamed up again along with Greg Leisz (steel guitar), Victor Indrizzo (drums) and Justin Meldel-Johnsen (bass). Lloyd Maines played steel guitar on the final 3 nights. On opening night, the Chicks opened with Wide Open Spaces and sang Lubbock or Leave It later in the show. Sin Wagon replaced White Trash Wedding for the final 3 shows. Mary is a Patty Griffin cover. The Eagles dropped Rocky Mountain Way and All She Wants To Do Is Dance after the second show. The $120 million Nokia Theatre has already begun to pay for itself: Last week, officials with L.A. Live developer Anschutz Entertainment Group announced that the 7,100-seat venue adjacent to Staples Center raked in $9,076,420 during its opening six-night run with the Eagles and the Dixie Chicks. Each of the Oct. 18-27 shows sold out, bringing 42,600 fans to the first part of L.A. Live to come online. "Not only were both these groups arena headliners in their own right, the venue served as an amazing backdrop for their immense talents," said Lee Zeidman, general manager of the Nokia Theatre, in a statement. Tickets for the shows ranged form $85 to $265. Click photo for larger image. All photos by R. Michelson.